While most of these thousands of bacterial species are friendly, others are not. The friendly ones have several benefits including aiding of digestion, vitamin K production, folate production and the destruction of harmful bacteria. However, certain day-to-day diet and lifestyle choices can negatively impact the population of these friendly bacteria – and by extension, overall health. Gut flora diversity is of critical importance for a healthy microbiome, as it enhances recovery from harmful physiological disturbances. Unfortunately, over the past few decades, the bulk of the diversity that once pervaded the western diet has been lost due to the economic pressures associated with increased food production. And according to FAO, “75 percent of the world's food is now generated from only 12 plants and five animal species” and that isn’t very good for our microbiomes, especially since the western diet rarely even includes all of these food sources. In a 2010 study that compared human intestinal microbiota from children characterized by a modern western diet and those on a rural diet (composed mainly of whole foods with high fiber content), the researchers found that the children on a rural diet had a more diverse gut flora and better gut health. So, what do you do? Eat a more diverse array of foods – specifically whole foods. Unlike their highly-processed counterparts, whole foods generally contain a wider range of nutrients, which encourages the growth of diverse bacterial species. 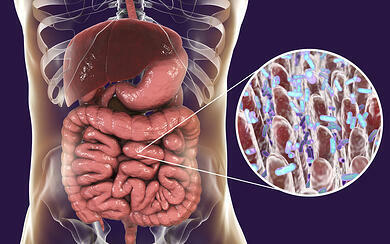 Prebiotics are basically a kind of fiber that passes through the gut without being digested. And although eating this kind of fiber may seem like a waste of digestion time, it actually encourages the growth of friendly bacteria in the gut. For instance, high-fiber fruits such as apples – with indigestible pectin making up 50% of its total fiber content – has been shown to promote the growth of helpful microbes like Bifidobacteria. A total lack of prebiotics in your diet may prove harmful to your digestive health, because it slows down the development and diversity of your gut flora. So, for proper microbiome development, you need to incorporate foods rich in partially digestible or indigestible fiber into your diet. Several foods in this category include oats, nuts, onions, garlic, leeks, asparagus, bananas, Jerusalem artichokes, lentils, chickpeas and beans. Sticking to a well-structured, fiber-rich diet plan can be challenging so supplementing with prebiotic fibers may be an option. According to a study in 30 obese women, a daily intake of prebiotic supplements over a 3-month period significantly promoted the growth of Bifidobacterium and Faecalibacterium, which are highly beneficial bacteria. You’ve probably heard how excessive alcohol consumption is bad for your liver, heart and brain, but what you probably didn’t know is that chronic alcohol consumption can also induce dysbiosis and affect gut health. In a particular study that compared the gut flora of 41 alcoholics with those of 10 healthy individuals with little or no daily alcohol consumption, the researchers observed that 27% of the alcoholics suffered dysbiosis in their microbiome, while none of the non-alcoholics did. In another study that compared the effects of three different kinds of alcohol – gin, red wine and de-alcoholized red wine – on gut health, it was observed that gin negatively affected the population of beneficial gut bacteria, while red wine improved it when consumed moderately. The beneficial effect of red wine can be attributed to its polyphenol content. Sleep deprivation has been linked to various health problems including heart disease and obesity. Research now shows that sleep deprivation also affects your microbiome health. According to a 2016 study, which examined the effects of short-term partial sleep deprivation on gut microbiodata, the researchers observed that after two days of sleep deprivation (4 hours per night), some subtle but noticeable changes had occurred in the gut flora. For the sake of the microbiome, 6-9 hours of sleep each night is recommended. To achieve this, set and maintain a regular bed time, cut out caffeine at least 6 hours to your bedtime, and turn off the lights, especially any blue light from electronic devices. Many people skip regular exercise for various reasons, but inadequate exercise perturbs multiple biological systems. Not only does it predispose us to weight gain, higher stress levels and a higher chance of developing a chronic disease, recent studies have shown it can also put your gut flora at a disadvantage. According to a 2014 study published in Gut, the researchers found out that professional rugby players “had a higher diversity of gut microorganisms, representing 22 distinct phyla,” almost twice the figure observed in the control group matched for age, gender and body size. In another study which examined the “differences in gut microbiota profile between women with active lifestyle and sedentary women,” the active women enjoyed a higher population of beneficial bacteria such as Bifidobacterium and Akkermansia. The study, therefore, concluded that regular exercise at low-to-moderate intensities helps the gut flora. On a final note, if you really want to enjoy all the benefits a healthy microbiome can afford this 2019, then eat a wider range of whole foods, take more prebiotics, minimize alcohol consumption, sleep more and exercise regularly… your gut will thank you for it.